Record-breaking ‘Flying Scotsman’ has arrived at Swanage Railway to be reunited with rare Devon Belle Pullman observation carriage for the first time in almost 50 years. The daughter of the man who saved the iconic steam locomotive from the scrapyard will wave off ‘Flying Scotsman’ from Swanage station when it hauls its first train on 22 March at the start of a three-week visit to the Isle of Purbeck. It was Penny’s enterprising and charismatic father, the late Alan Pegler, who purchased ‘Flying Scotsman’ from British Railways for the scrap value of £3,000 in 1963. During a test run in 1934, the Nigel Gresley-designed ‘Flying Scotsman’ was the first steam locomotive in the United Kingdom to haul a train at 100 miles an hour. 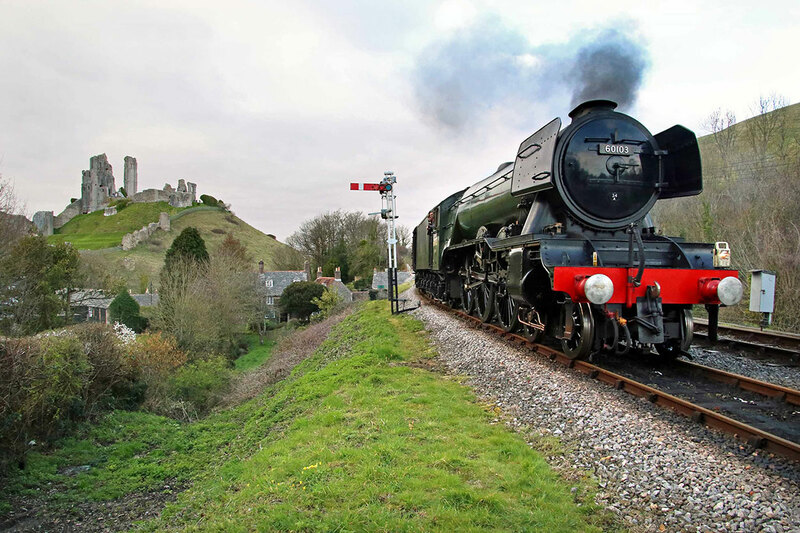 Swanage Railway business division director Mick Gould said, “It’s wonderful to see ‘Flying Scotsman’ safely arrived at Swanage – she is certainly the people’s locomotive and still has a very special place in the nation’s heart judging by the public reaction. While visiting Swanage, the iconic 1920s’ A3 class express engine – owned by the National Railway Museum in York – will be reunited with a rare late 1940s’ Devon Belle Pullman observation carriage, known as Car 14, for the first time in almost 50 years. From Friday 22 March to 26 March the locomotive will haul trains between Swanage, Corfe Castle and Norden with Devon Belle Pullman observation carriage Car 14 being coupled behind ‘Flying Scotsman’. After that, between 27 March until 10 April, the iconic steam locomotive and the Devon Belle Pullman observation carriage Car 14 will be on static display at Corfe Castle station with ticket-only access to board No 60103 and Car 14. ‘Flying Scotsman’ arrived on the Swanage Railway late-afternoon on 19 March after a two-day rail journey from the National Railway Museum in York. Purchased by the National Railway Museum in 2004, ‘Flying Scotsman’ was restored thanks to a £4.2 million, 10-year project funded by the National Heritage Memorial Fund and the Heritage Lottery Fund as well as from public donations.